Swapping the 2GR-FE V6 into the MR2 requires the addition of a coolant fill port in the engine bay. The simplest way is to add the port directly to the water outlet neck. This is a modification service. Send in the water outlet neck from your engine and I will modify it, pressure test it, and send it back. Turn-around time will depend on how busy I am, but typically should be one to two weeks. I can also weld shut "extra" ports such as those for the heater core or throttle body if you won't be using them on your swap. Please let me know if you want this done. For international customers or those looking for a zero downtime turn around I can source a water neck to modify, please contact me for more info. I typically point the coolant overflow port toward the intake manifold as shown in the picture. 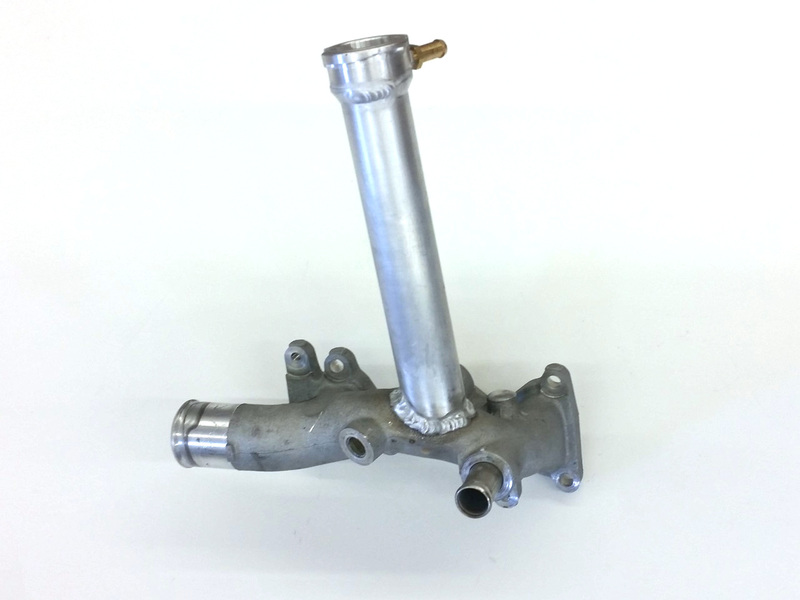 This allows the overflow hose to route down and follow the fuel line to the stock overflow bottle location. If you prefer a different orientation please let me know. Some water necks found on newer 2GRs have the throttle body heat port in a location that conflicts with the new filler. 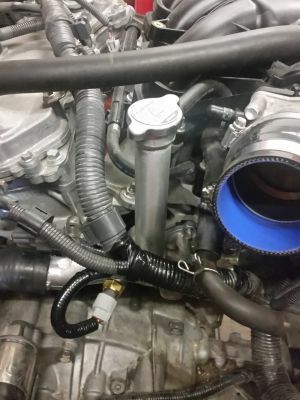 If you have one of these and want to retain the throttle body heater lines you will need to source an alternate water neck (usually less than $50 on eBay). The filler neck is compatible with your stock radiator cap. If you wish to run a higher pressure cap, the chart below has part numbers for compatible Stant radiator caps at various pressures. The stock MR2 cap is 13psi, however most 2GR equipped cars came with 16psi caps. This modification does not include a provision for the temp sender for the stock MR2 gauge. The simpler solution is to use a 3-pin temp sensor found on some Toyota models, as described in this thread on the MR2oc forum.